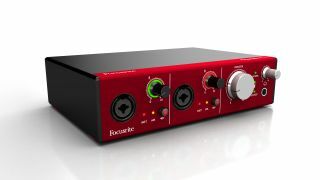 Focusrite's new range of professional interfaces sees the company finally bringing their preamp technology to thunderbolt devices. The claimed latency of less than a millisecond will showcase the benefits of making the switch from USB/FireWire. The range is spread across four models: the Clarett 2Pre (2i/4o) comes in at $499.99, the 4Pre (10i/8o) will cost $699.99, the 8Pre (10i/20o) will set you back $999.99, and the heavyweight 8Pre X (18i/28o) goes up to $1299.99. In pounds, it's £399.99 for the 2Pre, £549 for the 4Pre, £799 for the 8Pre, and £999 for the 8Pre X. All models feature said ADAT expansion to add eight more input channels, 24-bit/192kHz specifications, detailed metering and MIDI connectivity. Buyers will also receive a licence for Focusrite's new Red 2 and Red 3 plugins. All four Clarett interfaces will be available around Spring/Summer this year. See more on the Focusrite website.